It’s been a crazy week, and I didn’t have time to write a fresh post for my own blog, but I did write one for chick lit author, Erin Brady. I’m so happy to have “met” Erin and, after reading The Shopping Swap in just two sittings, I am officially a fan! 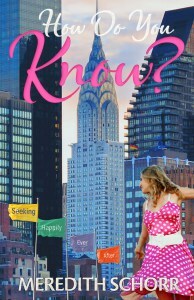 I am so excited today to be able to introduce you to one of my favorite chick-lit authors, Meredith Schorr. Her books are the best of chick lit! Her stories are well-developed and her characters are interesting and fun! If you haven’t done so already, I encourage you to check out her books and I’m very lucky to have her as my guest blog today and talk about why she became a writer. Thank you, Meredith! Thank you, Erin, for inviting me to your blog. I’m excited to be here and always welcome the opportunity to talk about my foray into writing.